Tomatoes contain a variety of important nutrients. Consuming tomato juice, either freshly squeezed or the store-bought variety, is a way to get the fruit's health benefits between meals. Although it's not as good a source of fiber as the whole fruit, tomato juice can be just as nutritious. Drinking tomato juice may protect against emphysema caused by exposure to second-hand cigarette smoke, according to a 2006 study published in the American Journal of Physiology-Lung Cellular and Molecular Physiology. The study's researchers, led by Satoshi Kasagi from the Juntendo University School of Medicine, found that lab mice exposed to cigarette smoke that consumed tomato juice did not develop emphysema, while those that didn't consume the beverage went on to develop the disease. Tomato juice is a rich source of lycopene, an antioxidant that may reduce the risk of cardiovascular disease and certain types of cancer. It also contains high levels of potassium, vitamin C, folate, beta-carotene, lutein and phosphorus, making it a virtual "cocktail" of antioxidant compounds. Consuming tomato juice may prevent cardiovascular disease in diabetes patients, according to a 2004 study published in the Journal of the American Medical Association. The study's researchers, led by Dr. Manohar Garg from the University of Newcastle, Australia, found that consuming tomato juice daily helps Type 2 diabetes patients maintain heart health. Diabetes often causes cardiovascular complications, and tomato juice appears to reduce platelet aggregation. 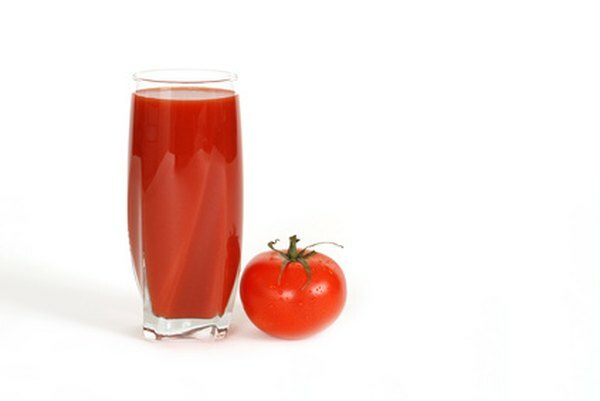 Researchers observed positive results after just three weeks of daily tomato juice consumption. The lycopene in tomato juice does not function alone, according to a 2003 study published in the Journal of the National Cancer Institute. The study's researchers, led by John Erdman Jr., a professor of food science and human nutrition at the University of Illinois at Urbana-Champaign, found that lycopene works in synergy with other phytochemicals in the tomato. The researchers recommend consuming fresh tomato products instead of lycopene supplements to get the full health benefits.